Product packaging is a perfectly natural medium for QR code use and more and more companies have begun to utilize this new marketing and advertising tool. Of course, as with most new technologies, some companies are better at using them then others, and QR codes are no exception. Most attempts at QR codes use that I have analyzed, in fact, have been pretty poor or simply an incomplete use of the tool. On occasion however, you find some truly fantastic uses, or at least examples where the QR code campaign was done in perfect alignment with general best practices. One example of this is from the beverage giant Coca-Cola, who last year introduced QR codes onto many of their Coca-Cola cans in Spain. For Coca-Cola to have entered the QR code world means that the technology is beginning to find its place in the market and finally take off. 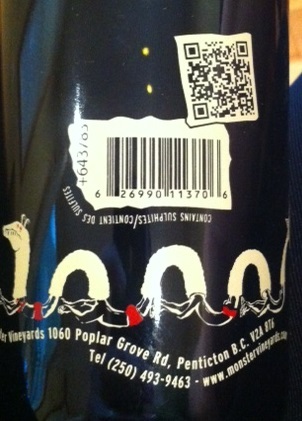 Though still a year later only a fraction of all beverage product packaging contains a QR code. It is my guess however, that with Coca-Cola’s success many more will begin to utilize this marketing and advertising tool as well. 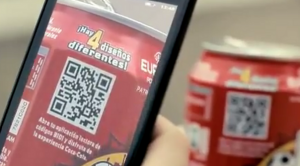 In the particular case of Coca-Cola, what they did was place a QR code on many of their cans and have them direct consumers upon scanning to relevant content. For example during the Euro Cup the code would direct consumers to Euro Soccer 2012 videos. Other relevant content consumers would be directed to were social media sites, various consumer competitions, and different relevant promotions. This campaign helped Coca-Cola connect with their customers, learn what interests them, how to market to them in the future, and all the while providing additional value and engagement with the consumer. The company that helped orchestrate Coca-Cola’s campaign, ScanLife, indicates that as of first quarter 2012, they had seen a 200% increase on scans from the previous year with the most successful content being videos, app downloads and product details, in that order. This growth looks to only continue as more companies jump on the bandwagon that companies like Coca-Cola got started, and if they use the QR code tool correctly they can expect to see great rewards. To ensure proper QR code use and a successful campaign, be sure to adhere to general best practices and use a platform that will help ensure you do so and more. The QR code opens a whole new dimension into the idea of tasting notes. The QR code brought me to the wine’s page on the Gehringer website, which mentions the sweetness code (0, or dry), what the blend percentages are (50% Cabernet Sauvignon, 20% Cabernet Franc and 20% Merlot)—and it also provides me with a price just in case I’d like to stock my cellar with this wine. Some wineries go so far as to include only the QR code on the back of their bottle—take for instance Red Eyed by Monster Vineyards. The back of the bottle includes a UPC, plus the QR code—other than a stylized Ogopogo (the Monster, I suppose), it’s just the address of the bottle. What a way to keep your bottle lines crisp and clean, but still provide information for your customers! Ensure that the QR code remains registered. Three of the codes I scanned did not work because they weren’t registered. Tracking is important! Just like analytics for your website, tracking on your QR code will allow you to figure out the pertinent information on your customers and the products they choose—which product is more popular, in which area, that sort of thing. Test! No matter how perfect you think your code is, testing is extremely pertinent – if a QR code doesn’t work, there’s no real point in having it. The use of QR codes for wineries and vineyards is expanding dramatically; not only can they be used to provide tasting notes, but for recipes as well. Instead of just mentioning that a wine is paired well with lamb, what about a specific recipe that uses the wine in the preparation of the dish itself? Are you interested in using QR codes and mobile technology in your winery or vineyard? Instead of muddling on your own, take a look at our best practices. For superb and sophisticated mobile websites, and a platform that will help you track your campaign and is light on the pocketbook, check out Qfuse. NFC technology has fantastic potential for an incredible number of industries and organizations, even despite the low usage in the United States. This low usage is sure to change as NFC slowly begins to find its place in the general market and companies begin to use it in their marketing and advertising campaigns. The rest of the world however appears to be ahead of the fifty States, whether it be in India, or now even Brazil, where we see a perfect recent example of how awesome, and how useful NFC can be to help engage the consumer, and help drive sales. This example of NFC being used in Brazil was orchestrated by the Billboard Magazine in an issue a couple months back. What the magazine did was insert an NFC chip into the pages where particular bands or songs were mentioned. 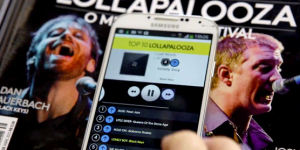 Then if you desired to listen to the band or particular track the consumer could simply place their phone near the page and they would automatically be directed to a webpage where the song can then be played for free. This exciting use of NFC helps make the written word come alive. Now as an article talks about some new band you can hear the music right at that same moment. And if you like the song you simply click to buy it on iTunes. NFC uses like this one can certainly help re-vitalize print media and help fuse offline and online media in ways never thought possible even a few years before. 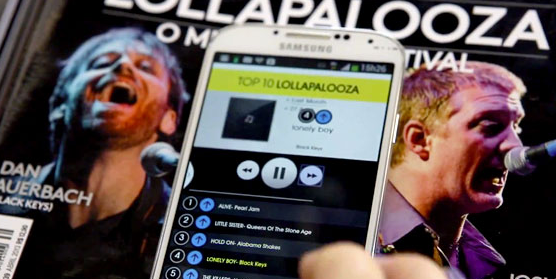 This genius use by Billboard Magazine in Brazil is only the tip of the iceberg of where NFC can go in the coming years. But as people begin to experience these great uses there will be no slowing it down, even in the many United States of America. If you do plan on using NFC technology in any of your marketing or advertising campaigns, just make sure you follow general best practices and are using a platform that can ensure a successful campaign and help increase you campaign’s efficiency. For more on this example of great NFC use, see the video below. I was strolling around Best Buy on a lovely Saturday afternoon and was surrounded by hundreds of QR codes as Best Buy places them on most of their product tags to let you scan them and learn more about each product. This QR code however—though a good idea for tech stores like Best Buy—was not the perfect QR code I referred to in my title. 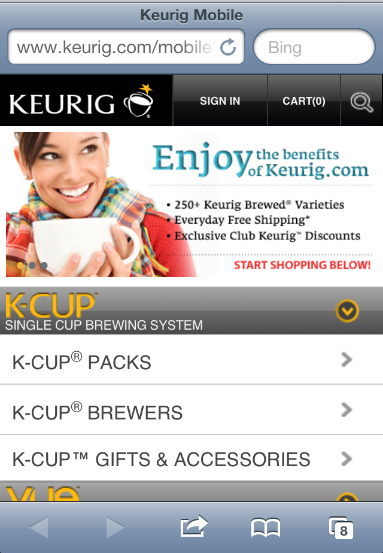 The QR code that I speak of was the QR code used by Keurig for their K-CUP product packaging, which I discovered after commenting to my girl friend about how much I wanted one. 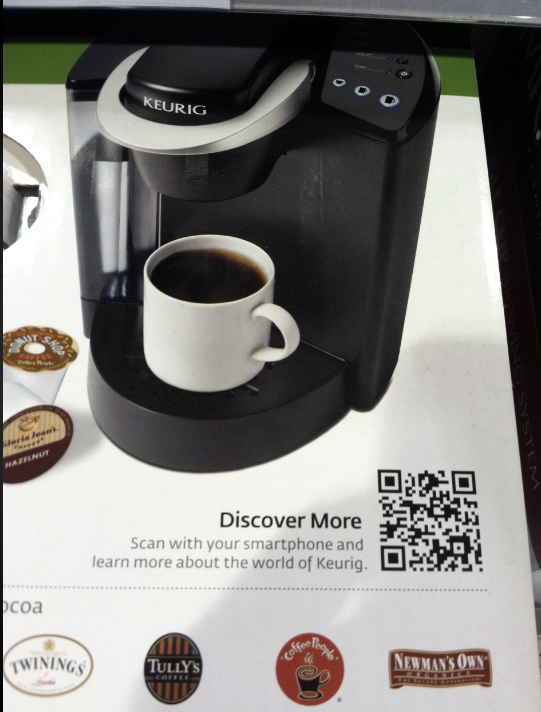 After admiring the many great flavors, I noticed the QR code on the front of the Keurig box and promptly analyzed everything about the code. After my analysis it seemed to be an almost perfect QR code use, and thus a great example for other organizations of how to use this technology right. The first thing I noticed was the good call to action: “Discover More. Scan with your smartphone and learn more about the world of Keurig.” This call to action is perfect in that it indicates to the consumer what to do with the code and also what the code will do for them upon scanning, in this case allowing them to learn more about Keurig. 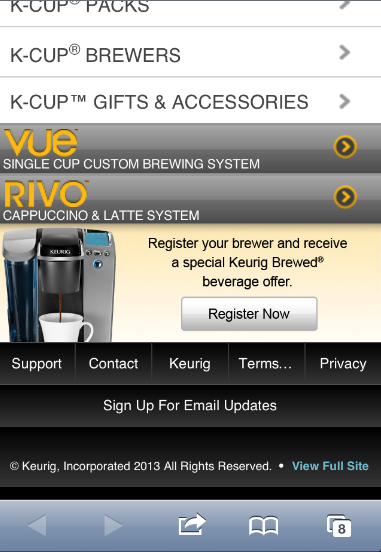 The mobile website here is great not just for its look and functionality, but for what if offers. 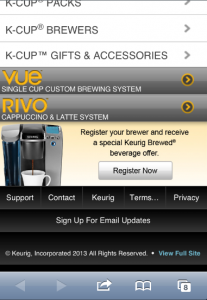 You can use the mobile site to learn more about Keurig, the K-CUP, and their other products like the Vue and the Rivo just as the call to action stated. In addition to this however, you can also make purchases right through site for all coffees, teas, and other flavors, perhaps some that are not offered at Best Buy, thus helping to increase potential sales and make things more convenient for the consumer. The mobile site also lets consumers register to receive deals sent to them through email, provides them with an incentive to sign up. The only negative thing I would comment on is that they should mention the fact, in their call to action, that they can also make purchases and can register for deals by scanning the QR code on the box. Other than this single criticism, this is clearly a perfect use of QR codes and their mobile website. For anyone reading this trying to figure out how to use QR codes and mobile technology, this is how it is done. For more help please be sure to read our best practices. For an inexpensive platform that allows you to track your campaign, provides you with great looking mobile websites, and helps ensure you are using the technology correctly, be sure to check out Qfuse. NFC technology, like QR codes, have an almost unlimited number of possible uses, and are continuing to see their popularity rise as smartphone use increases and both technologies begin to find their way slowly into the general American vocabulary. NFC technology came on a bit later than QR codes but has begun to see its adoption rise dramatically in recent years. One of the main ways it has been used is for taking of payment. The reason for this is the ease of use and convenience for consumers, as they simply need to flash their smartphone or NFC enabled credit card to make a payment. One such example of NFC use can be found in San Francisco, where they found a great way to utilize NFC technology as a payment method for all on-street parking spots, some 30,800 in total. In order to implement this NFC payment system it simply required NFC enabled stickers to be posted on all parking meters. 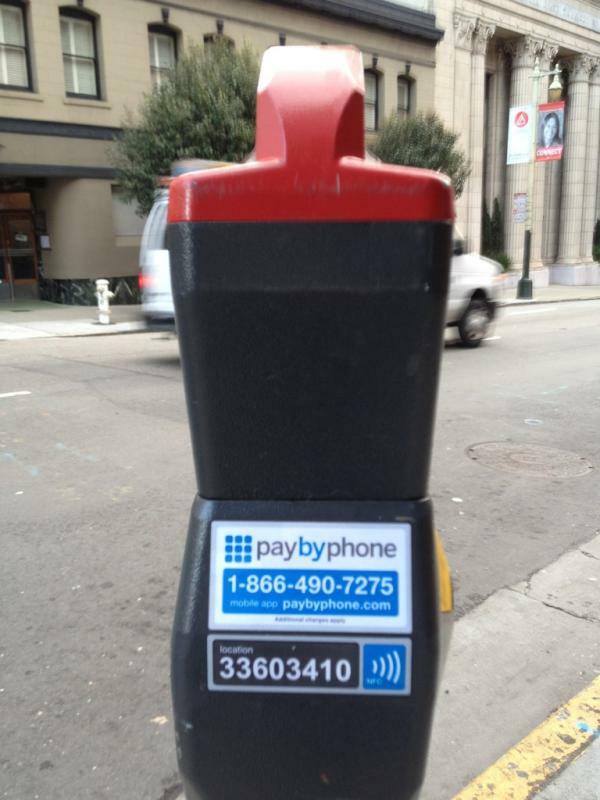 This allowed for NFC enabled smartphones to simply be waved in front of the meter to pay for parking. When this is done a screen pops up on the user’s phone and allows the user to enter how long he wishes the meter to run. This use of NFC allows people to pay for meters in an easy convenient manner and without the hassle of searching for loose change (though you can still pay with change). In this instance though, the NFC technology is not only for ease of payment, but it also serves an added benefit. When users meter is near expiration they are notified via text message. They are then able to log back into their parking meter and add additional time if they so desire, helping to reduce the likelihood of receiving a ticket. This sort of NFC use can, and should, be used in most towns and cities across the country. It is inexpensive to use and allows for an increased efficiency of similar payment methods, often decreasing the need for labor and lowering operating costs. NFC technology has many uses and this is just one example, but no matter the organization you are a part of it is an almost guarantee you could find a way to use this technology to improve your business and even increase profits. Just make sure you are using it correctly and have a platform that ensures you are getting as much out of your campaign as you can.